Raymond Kolbe was born January 8, 1894 at Zdunska Wola, in Russian occupied Poland. In 1906 around the time of his First Holy Communion, the Blessed Virgin Mary appeared to him. She offered him the graces of virginity and martyrdom and asked which of the two he wanted. Kolbe asked for both. In 1907 he joined the Order of Friars Minor and took the name Maximilian. He was ordained to the priesthood in 1918. 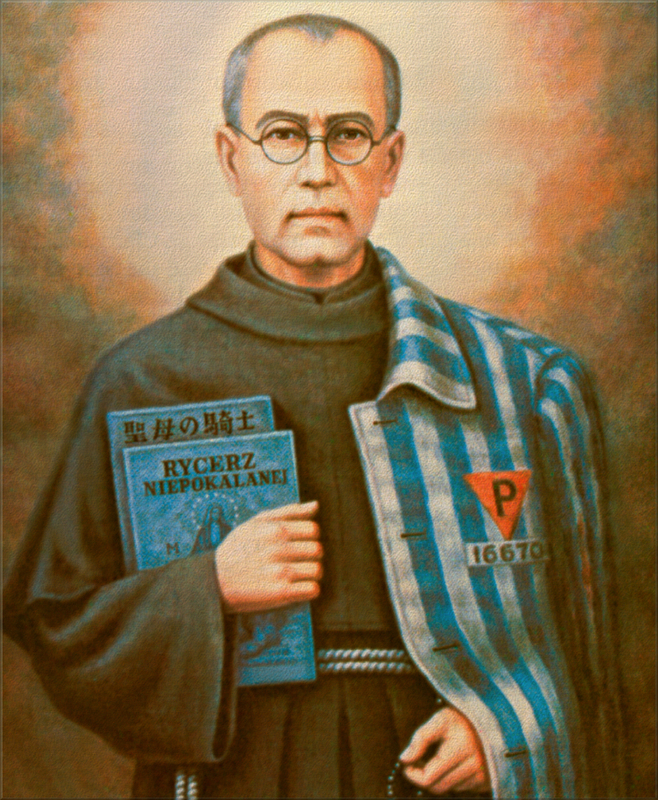 In 1936 Father Maximilian became superior of Kiepokalanow (in Poland) and director of what was then Poland’s chief Catholic publishing complex. When Germany invaded Poland in September of 1939, Father Maximilian realized that his monastery would be taken over. In advance of this, he sent most of the friars home. On February 17, 1941 he was arrested on charges of aiding Jews and the Polish underground. On May 28th he arrived at Auschwitz. Fr. Maximilian volunteered to take the place of a married man who was ordered to be starved to death. He died at the age of forty-nine years a martyr of charity.